DCI Matilda Darke is a detective that I have somehow not had the pleasure of meeting before. I’m not sure how the first two novels in the series passed me by, but somehow they did and I really need to go back and revisit them. I must stress at this point, that this novel can definitely be read as a standalone, I would just like to read more about Matilda. Starling House is home to some of Britain’s deadliest killers, none of them old enough yet to be in an adult prison. When their newest arrival, Ryan Asher is found brutally murdered in a pool of blood, the police are suspicious. Despite the violence of the crime, his body is at odds with the rest of the crime scene, it looks to have been staged. And there are no shortage of suspects. For those outside Starling House, suspicion would naturally fall on the remaining ‘inmates’, but DCI Matilda Darke and her team focus upon Starling House’s staff. If the house is as secure as everyone says it is, then they can be the only true suspects. After a trying few days in which very little progress is made, there is a major blip in their investigation, another body is found. This time hanging from a tree. It is another of the boys from the house, and his death also seems staged. Made to look like suicide when it was clearly murder. 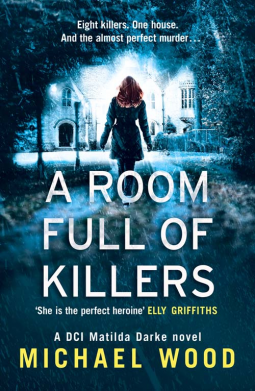 A room full of killers is a very interesting take on the traditional crime novel, with its difficult and controversial subjects, and I loved the ending. I look forward to the next DCI Darke instalment. A room full of killers is available now via Amazon online and all good book shops. Thank You to the publishers who invited me to view an advanced copy of this novel via netgalley in exchange for an honest review.